That’s a most welcome improvement even though it has dampened (pun intended) our enthusiasm for day hikes as of late. The other reason is that both Wendy and I have had a lot of school work. In my case, I have spent a great deal of time working through the selection and quoting of furnishings and technology for the new Phillips 66 Innovations Labs at the high school, funded by part of a $1.7 million grant to provide improved facilities and equipment for Science, Technology, Engineering, and Math (STEM) in our secondary schools. But on a Saturday in mid-May we finally ventured out of town for a stroll. The draw was the Broken Arrow Rose Festival. 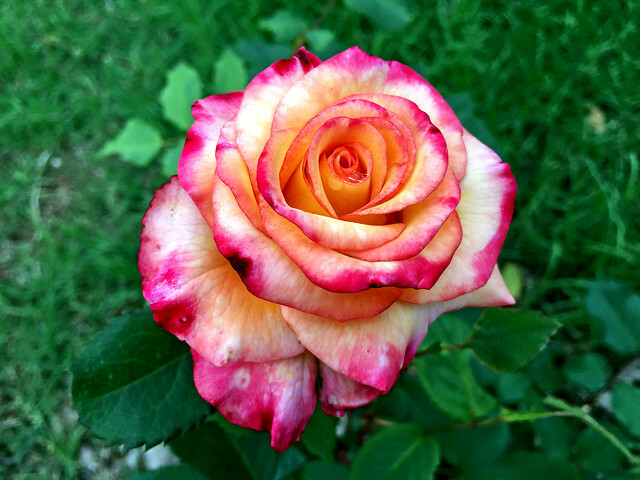 Wendy loves growing roses; she currently is growing a Social Climber at her apartment, and tends for a Perfume Delight and a Dream Come True planted by my patio. Her Social Climber gets daily attention and has been putting on a show. To make it easier for her to tend the roses at my place, this weekend we put together a storage bench for the patio where she can stow her implements. Several weeks ago I was perusing the Tulsa area events calendar and learned about the Rose Festival in Broken Arrow. 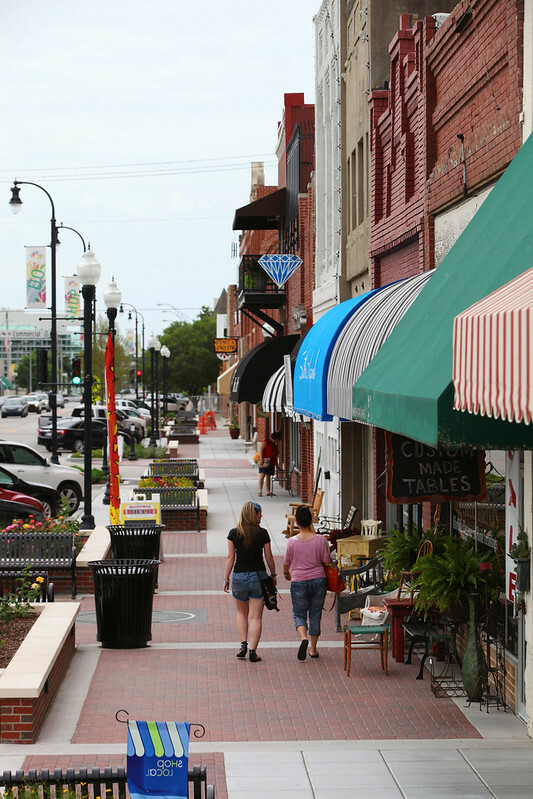 I’ve never spent any time in the old downtown of Broken Arrow, a town which has evolved into a large bedroom community southeast of Tulsa. So I had no idea that they had planted roses all along Main Street as part of their Rose District initiative, along with improved sidewalks and a growing arts and entertainment scene. Given her love of roses, there was no question that Wendy and I would be at the rose festival this year. We first went into the Historical Museum to view some rose paintings and photographs, but the somewhat creepy dolls with their long eyelashes were more memorable than those works. We strolled over to the adjacent Farmers Market to see the various prize winning blooms, arranged by color. But the most fun was to be had strolling in a long loop along Main Street, stopping at each planter for Wendy to admire, identify, and often sniff the blooms. This coming week we wrap up the school year. Then we’ll spend a week recovering our wits before heading out to spend the first part of June in Arkansas at Mount Magazine and Mount Nebo, getting in some hiking before the heat and humidity make Arkansas hikes too miserable to contemplate. Hi. I was wondering if you have ever made it back to Chandler Park? I grew up in Berryhill ( which surrounds Chandler Park South & East). I walked around & ‘explored’ it for years & back then never heard about any Lost City. No talk, no signs nothing. lol There was a small ‘cave’ looking hole that I was always too scared to crawl into cause it was so dark inside. Of course, being a kid, I never carried a flashlight. So I had no idea if this hole got smaller, tighter or not. I dont know how deep it went as it was too dark to see. I thought it made no difference if I went in cause if I did crawl to back of it I still couldnt see anything cause of the darkness & there could be some type of animal hiding in there. On the other side of Berryhill up in the hills there was a old rock ‘lean to’ thing that i would guess the old Indians could shelter theirselves from a storm. Seems that there was old Indian drawings on the walls. Glad to see you two getting to do things together & explore together.